On this page we compile some sources for the best Disney music. A great place to find Disney music is Amazon.com — you can find individual CDs, or you can buy and download individual MP3 files. We’ve bought thousands of MP3 files from Amazon over the years. The quality is excellent and there is no DRM, so it’s always easy to copy them onto any kind of device, whether it be your phone, a home music server, or an iPod or other music player. One great thing about Amazon.com’s music store is their AutoRip feature. Many of their CDs (including most of the CDs recommended by MouseSavers.com) come with a FREE MP3 version of the album, which you can listen to via their web site or download to your computer. This is not some kind of limited version – it’s the full album at the regular (high) quality you would get buying the MP3 album directly. In fact, fairly often the CD version with AutoRip is cheaper than the MP3 version, so Amazon is literally paying you to send you a CD. Make sure to check the prices between the two versions before buying, though note that not every CD comes with AutoRip – look for the AutoRip logo just under the price on the Amazon page. The Lion King Soundtracks – The music, by Elton John and Tim Rice, is inspiring. There is The Lion King Special Edition Movie Soundtrack, which many people like for its familiarity, but the vocal performances are especially impressive on The Lion King Original Broadway Cast Recording. Mary Poppins Soundtracks – The Mary Poppins movie soundtrack is a true classic, with music by the Sherman brothers. For a different version, try the Mary Poppins London Cast recording from the live musical. Beauty and the Beast Soundtracks – Alan Menken and Howard Ashman wrote a clever score for this family favorite. Most people like the Beauty and the Beast Special Edition Soundtrack (the movie soundtrack version), with the familiar voices of Broadway greats Angela Lansbury and Jerry Orbach, better than the Beauty and the Beast Original Broadway Cast Recording, but Broadway musical lovers may prefer the cast album. Nightmare Before Christmas Original Motion Picture Soundtrack – Danny Elfman’s considerable talents are well-displayed in this excellent soundtrack where Halloween meets Christmas. Spooky yet exuberant, chilling and funny by turns. For fans of the movie — or just fans of Elfman — this is a must-have. Stay Awake: Music From Vintage Disney Films – An outstanding compilation album performed by big names in rock and pop, including Natalie Merchant, James Taylor, Bonnie Raitt and many more. Beauty and the Beat! Favorite Disney Tunes in Steelband Style – A festive recording by the Trinidad and Tobago Showboat Orchestra that will make you feel like you’re on a Disney cruise in the Caribbean! Includes music from The Little Mermaid, Beauty and the Beast and more, all played on steel drums. The Disney Reggae Club – Disney songs performed by reggae artists, including Steel Pulse and Toots & the Maytals. Can’t beat this for fun! Disney’s Fairy Tale Weddings – This CD of nicely orchestrated Disney tunes is a perfect soundtrack if you are having a Disney-inspired wedding, or just for a romantic evening. Includes classics such as “So This Is Love,” “Some Day My Prince Will Come,” “Can You Feel the Love Tonight” and of course “Bella Notte” from Lady and the Tramp! Magical Music of Disney focuses on music from four Disney musicals (The Lion King, Aladdin, The Little Mermaid, and Beauty and the Beast). A Disney Spectacular is more of a “greatest movie hits” CD, with music from Pinocchio, Mary Poppins, Alice in Wonderland and other classic films. Heigh-Ho! Mozart: Favorite Disney Tunes In The Style Of Great Classical Composers – Really a fun way to introduce children to classical music. Includes such delights as “Winnie The Pooh, in the style of Sergei Prokofiev” and “Beauty and the Beast, in the style of Sergei Rachmaninoff”! If you enjoy Heigh-Ho! Mozart, there’s a sequel: Bibbidi Bobbidi Bach: More Favorite Disney Tunes. Disney’s Happiest Celebration on Earth – This CD was released in celebration of Disneyland’s 50th anniversary. It includes 22 favorites from the Disney theme parks, such as “”(Yo Ho) A Pirates Life For Me,” “Grim, Grinning Ghosts,” “it’s a small world” and lots more! 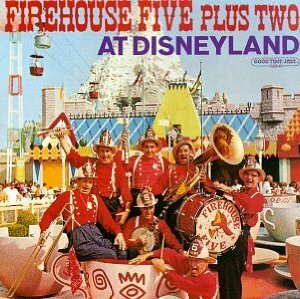 Firehouse Five Plus Two at Disneyland – Firehouse Five Plus Two was the Dixieland jazz band formed and led by Ward Kimball, one of the original Disney animators (and an excellent jazz musician). This band performed its wacky, infectious, toe-tapping music in the early days of Disneyland — the album was recorded in 1962. While they don’t perform any Disney songs, their special brand of “Disney music” will remind you of Main Street USA — a rootin’, tootin’ good time! Ragtime at the Magical Kingdoms – Chris Calabrese performs great ragtime piano using music every park attraction you can think of, and then some. There’s music from Main Street, the Haunted Mansion, the Golden Horseshoe Saloon, Toontown, World Showcase and much more! And if that’s not enough — there’s also an interview with Walt Disney from 1959! Just fantastic. Walt Disney and the 1964 World’s Fair – If you’re a fan of Walt Disney, the early days of Disney theme park attractions and/or the 1964 World’s Fair, you’ll love this CD boxed set!